National Library of Medicine Deputy Director Betsy L. Humphreys has been awarded the highest honor in the field of biomedical informatics. The American College of Medical Informatics (ACMI), the honorific college of the American Medical Informatics Association (AMIA), presented Ms. Humphreys with the 2009 Morris F. Collen Award of Excellence, named after a pioneer in the field of medical informatics. The Collen Award recognizes a body of work that has influenced biomedical informatics throughout an entire career. Humphreys was honored for her personal commitment and dedication to biomedical informatics, which has made a lasting impact on the field. 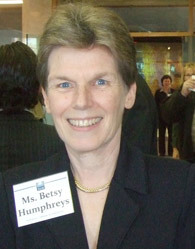 A graduate of Smith College, Humphreys came to the NLM in 1973 after finishing her master’s degree in library science at the University of Maryland, took on increasing responsibility, and became deputy director in 2005. Her unique achievements include coordinating NLM’s creation of the Unified Medical Language System (UMLS) . UMLS is a collection of tools and resources that enable computer systems to link biomedical information from different sources, such as patient record systems and bibliographic databases. It also helps in the development of computer programs that behave as if they “understand” the meaning of the languages of biomedicine and health—so that when a user makes an inquiry, the program retrieves the relevant information. Before that she developed the SERHOLD database, which became the basis for NLM’s interlibrary loan system, DOCLINE. Past Collen Award winners include NLM Director Donald A.B. Lindberg, MD, and Clem McDonald, MD, director of the Lister Hill National Center for Biomedical Communications. The American College of Medical Informatics is a college of elected fellows from the United States and abroad who have made significant and sustained contributions to the field of medical informatics. It exists as an elected body of fellows within AMIA, with its own bylaws and regulations.